Look for another post regarding this meeting coming out this coming Friday. We completed work on the Culver Antiquarian and Historical Society Museum and Visitors Center this Spring. The project created space for them in the W. O. Osborn‘s old offices in the First Farmers Bank & Trust building in Culver. We haven’t done any work in the bank since its most recent incarnation as First Farmers Bank & Trust, but I remember working for Easterdays on projects there back when I was in college and I know there were multiple earlier projects as well. The project involved adding walls and doors to create a segregation between the bank’s space and the Museum/Visitors Center. This was so bank security could be maintained when hours differed. 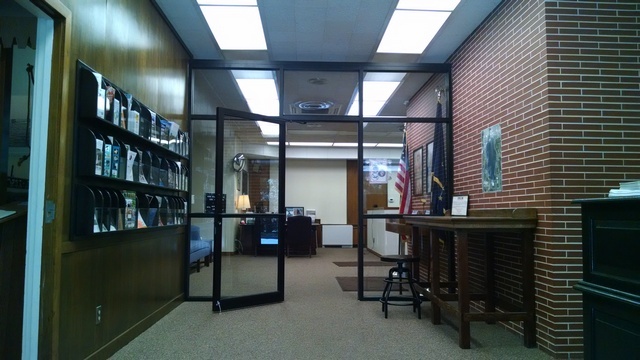 A hallway was sealed off and an aluminum and glass partition wall created a separation in the lobby. While it wasn’t possible to bring make the existing bathroom accessible, we did create an accessible path between the lobby and the bathroom. The age of the bank building made it necessary to due various code updates such as adding exit fixtures along the accessible path. Our contact for this project was George Duncan and we enjoyed working with him on this. As with all committees, there are challenges due to lots of opinions. George did a great job insulating us from those issues and keeping things moving smoothly. One of the more interesting aspects of this project was their desire to create video viewing area. Since much of Culver revolves around the lake, they wanted to do this with a mock boat theme reminiscent of the old tour boats that used to be on the lake. (I remember the “Maxinkuckee” that was docked at the park when I was a kid and I remember the Doodle-bug which was a venture launched by Muelhausen’s. The Doodle-bug was the last tour boat I recall.) The boat was created with two half walls. We cut curved ribs to create a curved wall. We also cut curved wall caps and base plates to simulate a curve at the bow. The curves are subtle, but sufficient to give the desired effect. We then used shiplap siding to create the hull. One of our carpenters, Mugurel Stefan, did an excellent job with the millwork and construction of the boat. To be more economical and to put his touch on things, George came in and painted the shiplap siding at our shop. He also applied the polyurethane to the oak members used for rail and columns for the canopy. The Antiquarians provided and installed the canvas canopy at the top. Inside the boat we installed bench seating and a cabinet to house a DVD player. The cabinet sports a ship’s wheel to keep with the theme. 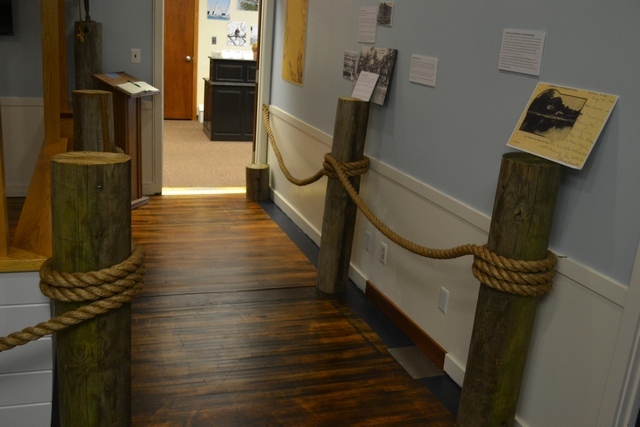 To further make the feeling authentic, we took used utility poles, cut them and installed them along both sides of the walkway by the boat to simulate pier moorings. 1-1/2″ jute rope wraps the poles and spans between them. The old wood floor was exposed also. As you walk in beside the boat, you seem to be on a dock. If anything, it came together better than expected. It’s always interesting what grabs people’s attention. We’ve received more questions about the pier mooring and the rope than anything else. They didn’t come close to the degree of difficulty involved with the curved boat walls! The Antiquarian and Historical Society is a repeat client for Easterday Construction. 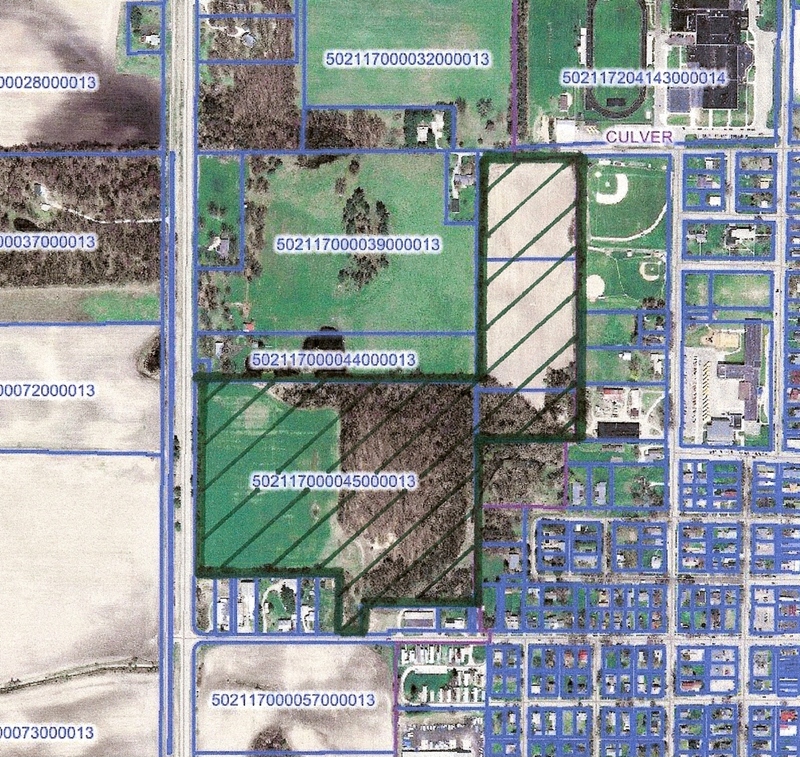 We completed the construction of the pergola and lattice panels for Heritage Park. We did the buildout for their original home in the basement of the Carnegie portion of the Culver Library. The area had been relegated to basement storage and we upgraded it to modern museum space, installing wainscot, carpet, and electrical including lighting. Later we were called back to enhance the museum entrance where we installed a replicated portion of the park pavilions which were formally platform shelters for the train depot. 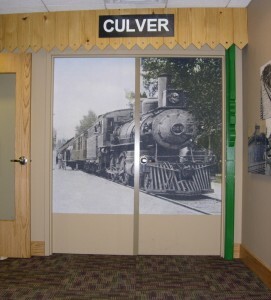 We put a mural on the adjacent doors and installed artwork using double French cleats. We’re always glad when a client is pleased with our work and calls us back for round two… and in this case round three and four! Easterday Construction Co., Inc. was pleased to have the opportunity to work with the Antiquarians again. 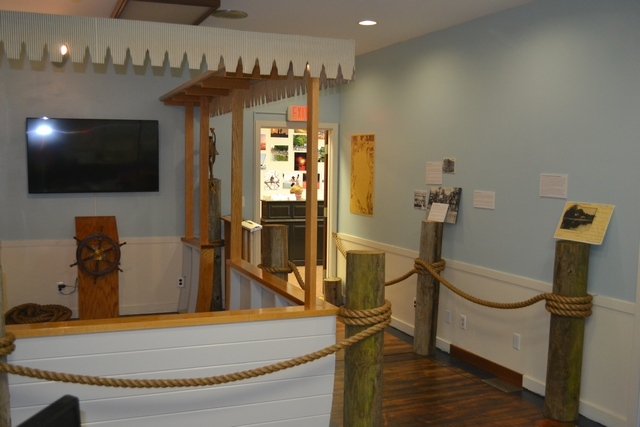 In recognition of this, we were pleased to donate the pier moorings portion of the boat display to the museum. 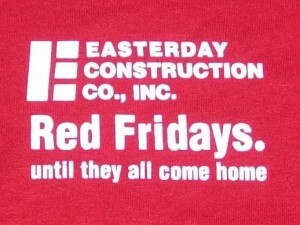 Easterday Construction will be participating in Red Shirt Fridays again this year to show our support for our troops. All of our employees have been given red shirts like those to the right. Participation is voluntary, but on random Fridays all ECC employees wearing their red shirts get a $5 bonus. At the end of the summer, an equal amount will be contributed to Bugles Across America, a not-for-profit organization started by Tom Day of Berwyn Illinois to provide live bugle players for the funerals of service men and women. 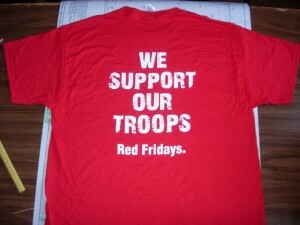 Red Shirt Friday is a national not-for-profit organization that promotes recognition of those that serve in our armed forces and what they sacrifice for us. All of us at ECC are proud to show our support. The Marshall County Visitors Bureau is promoting a contest to choose the best burger in Marshall County. Several Culver restaurants are on the ballot in round one, so now’s your chance to step up and vote for your local favorite. Click on the graphic to the right or go to the Visitors Bureau site and follow the links to the bracket.